The motifs of judgment and blessing or salvation that so frequently appear together in Isaiah are present here again. The immediate problem for Judah was that King Sennacherib of Assyria and his army were coming against Judah. But this proud destroyer would be destroyed by the Lord. The “traitor” (33:1) may be those in Judah who were urging King Hezekiah to seek an alliance with Egypt to protect the nation from the Assyrians. This was against God’s will for His people, as Isaiah told them, and thus was an act of betrayal against God. But both the Assyrians and those who failed to heed God would fall. In contrast to the fate of the wicked, the latter half of chapter 33 clearly describes those who will live and see God’s salvation. The righteous will see the end of the Assyrian threat and enjoy abundance and health. The judgment of all of God’s enemies is the subject of Isaiah 34, with Edom as representative of all who oppose God. Edom was Israel’s close relative, the land of Esau’s descendants. But the Edomites made themselves Israel’s perpetual enemy, and would suffer terrifying judgment. And after God deals with His enemies, the land of Israel will enjoy the blessings of Messiah’s reign. According to Isaiah 33:6, what is the key to enjoying the blessings of God? Who are the people of Isaiah 33:18–19 who will be seen no more in Judah? Why are all the nations summoned to pay attention to Isaiah’s message in chapter 34? In what way has the prophecy of Isaiah 35:12 been realized in the reestablishment of the nation of Israel? What is the “Way of Holiness” (35:8)? 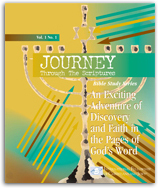 These chapters present a majestic picture of the power, love, greatness, and glory of the God of Israel! He is worthy of our worship and our obedience, for there is no one like Him. Give thanks to the Lord for being our “judge,” “lawgiver,” “king,” and “he who will save us” (Isaiah 33:22).